As busy now as he was before he retired, Graham Bennett plays golf once a week, travels with his family once a month and the rest of his time he dedicates to giving something back to the country that has become his second home. “My dance card is full,” he says. When he retired, staying on was an easy decision, made even easier by the Malaysia, My Second Home (MM2H) programme which allowed him to convert his work permit to the MM2H visa. 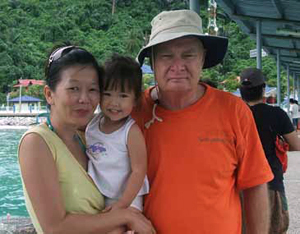 There are countless golf courses around Malaysia and many of them have been the site of international golfing events, though Graham enjoys playing his weekly game on a quieter neighbourhood course. As for travel, “I love Malaysia’s central location,” he says. “It is one flight to Australia, one flight to Europe, one flight to almost anywhere.” In addition, air flights are cheaper from Malaysia than from many other countries. Graham goes back to Australia once or twice a year but he also takes monthly trips elsewhere with his wife and daughter. When Graham lived in Australia he was active with Rotary, a worldwide organisation of more than one million volunteers. Rotary’s motto is “Service Above Self” and its volunteers work together to improve the conditions of others, both at local and global level. When in Thailand he had to take a break from the organisation because, although there was as strong a presence there as anywhere else, there were no clubs that spoke English. Since English is widely used in Malaysia, this was not a problem once Graham moved here and to hear him tell it, it sounds like he had found and joined a club before he had even finished unpacking. “I get the greatest satisfaction from giving back to my community,” Graham says.